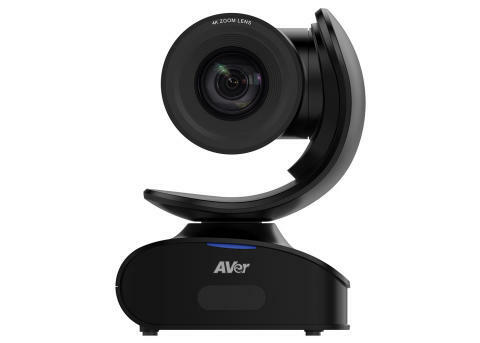 FREMONT, Calif.--(BUSINESS WIRE)--AVer Information Inc., award-winning innovator of video conferencing technology, announces the next evolution of USB conference camera: the CAM540. The all new CAM540 Cloud Video Conference Camera is a marvel of modern engineering and design that is inviting as well as functional. An ultra-portable, professional-grade USB PTZ camera, the CAM540 is a sleek, polished video conferencing camera optimized to deliver a dynamic video communication experience to your meeting room this fall. A high-quality USB PTZ camera perfect for mid to large conference rooms, the CAM540 captures super sharp, accurate color up to 4K at up to 30 frames per second. The CAM540 uses high quality sensors and multi-lens glass to produce the sharpest and most accurate color ever; it's "like looking through glass". With one of the fastest and smoothest true 16X zoom wide angle cameras available on the market, even the tiniest details can be seen at optimal distances. Precisely engineered with smooth bearings and whisper quiet motor and an 86 degree field of view, the CAM540 delivers rapid and smooth pan, tilt and zoom motions with absolute clarity at every focal length. The CAM540 is loaded with features to create a simple user experience and beautiful picture. For easy setup, the CAM540's USB plug-and-play feature allows you to connect to virtually any desktop or laptop via a single USB cable and is compatible with all of your favorite apps, Cloud Services and audio systems. The CAM540's state-of-the-art SmartFrame technology allows participants to have an optimal hands free experience by automatically optimizing color and light while framing faces with amazing clarity. To customize your meetings, the CAM540's PTZ app allows you to set up to 10 camera presets that can easily be accessed with the touch of the remote saving you time and providing flexibility to move swiftly to pre-determined locations in your conference room. "The end user experience played a critical role in the design and development of the CAM540. Our focus on the customer's needs led us to create an amazing 4K camera with a streamlined design and quiet motor that is currently missing in the marketplace. At AVer, we are continuously striving for the best user experience and stretching the boundaries of what's possible," said Carl Harvell, Director of Product Marketing at AVer Information Inc.
"AVer's CAM540 offers a razor-sharp 16X zoom with a whisper-quiet Pan/Tilt/Zoom that is integrated with the Zoom Rooms controller. The CAM540 has a small form factor that creates a streamlined look and installation into our Zoom Rooms is truly plug-and-play," said Oded Gal, Head of Product Management for Zoom Video Communications..
For more information about AVer Information Inc. products, visit averusa.com or call (408) 813-8696. AVer (averusa.com) is an award-winning provider of visual collaboration and education technology solutions that improve productivity and enrich lives. From accelerating learning in the classroom to increasing competitive advantages for businesses, AVer solutions leverage the power of technology to help people connect with one another to achieve great things. Our product portfolio includes Interactive Flat Panels, USB Video Conferencing Camera Systems, Document Cameras as well as Sync and Charge Solutions for Mobile Devices. We strive to provide industry leading service and support that exceeds our customers' expectations. We are also deeply committed to our community, the environment, and employ stringent green processes in all we do. Learn more at averusa.com and follow us on twitter @AVerVC. A high-quality USB PTZ camera perfect for mid to large conference rooms, the CAM540 captures super sharp, accurate color up to 4K at up to 30 frames per second. The CAM540 uses high quality sensors and multi-lens glass to produce the sharpest and most accurate color ever; it's \"like looking through glass\". With one of the fastest and smoothest true 16X zoom wide angle cameras available on the market, even the tiniest details can be seen at optimal distances. Precisely engineered with smooth bearings and whisper quiet motor and an 86 degree field of view, the CAM540 delivers rapid and smooth pan, tilt and zoom motions with absolute clarity at every focal length. \"The end user experience played a critical role in the design and development of the CAM540. Our focus on the customer's needs led us to create an amazing 4K camera with a streamlined design and quiet motor that is currently missing in the marketplace. At AVer, we are continuously striving for the best user experience and stretching the boundaries of what's possible,\" said Carl Harvell, Director of Product Marketing at AVer Information Inc.
\"AVer's CAM540 offers a razor-sharp 16X zoom with a whisper-quiet Pan/Tilt/Zoom that is integrated with the Zoom Rooms controller. The CAM540 has a small form factor that creates a streamlined look and installation into our Zoom Rooms is truly plug-and-play,\" said Oded Gal, Head of Product Management for Zoom Video Communications..